One of the simple pleasures of life is a good, hot shower. There’s nothing quite like turning on the water and getting a wonderful stream of clean, warm (or cool, depending on the weather) cascading down upon your upturned face. It’s blissful, and a good shower awakens the body and revitalizes the mind. Also, your shower might make you sick. At least, that’s what researchers from the University of Colorado-Boulder say. The culprit is the lung-disease spreading Mycobacterium avium, which can live in water droplets and forms a film on the inside of dirty shower heads (secret bacteria pockets are gross). Said Norman Pace, lead researcher on the study: “If you are getting a face full of water when you first turn your shower on, that means you are probably getting a particularly high load of Mycobacterium avium, which may not be too healthy.” While most people are safe from M. avium’s harmful effects, the elderly, pregnant women, and people with compromised immune systems are at risk from this sickness. Symptoms of M. avium are weakness, a dry cough, tiredness, and shortness of breath. 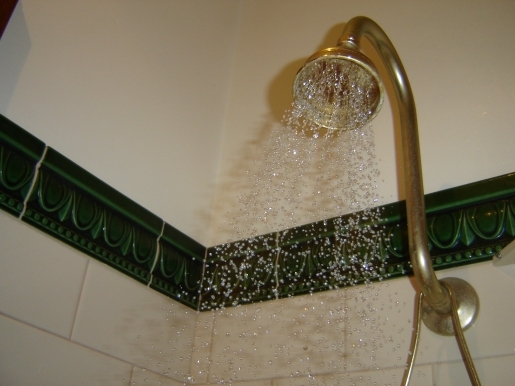 The disease seems more prevalent in plastic showerheads than metal ones, so if you’re looking for a good excuse to make the switch, a change in bathroom fixture might do you some good. Alternately, you could do what I do and turn the shower on for a brief burst, then adjust the temperature and get in. Of course, I just do it to avoid the cold residue of last night’s shower, rather than out of some health preservation urge; nobody likes a cold shower, after all!